5 Stars! Excellent! We loved our stay in Kulalani and our townhouse was beautiful! When we arrived, our amazing and so tastefully decorated place was stocked with everything we needed to begin. What sets this experience apart from the many other great VRBO rentals we have done in Hawaii is the attention to detail and tremendous service Wendee provided from beginning to end. On top of being a great home, the unit is very close to the pools and fitness center, which is a huge bonus. Foodland, which we find very reasonably priced and with a huge selection of great options for the home or beach, is a 10 minute walk away, as are a number of other ships (We tried to get to farmers markets as that is where the best fruit and vegetables are to be found at super cheap prices.) Overall, the beaches were beautiful, the home was the best we have stayed and the service soooo great! Cant recommend this place enough! Mahalo to Wendee and the home owners! The condo was in good condition and the location was perfect. Wendee was a pleasure to work with and ready to answer any questions, from the time we made the reservation to the time we left the property. The grounds of Halii Kai are beautiful and the staff at the ocean club are friendly and helpful. We plan to go back to visit Hawaii in two years and will definitely love to return to HK2D! Thank you again for the great place. We have been to Hawaii nearly 10 times and visited the Big Island 10 years ago for our marriage. This place at Halii Kai was one of the best places we have stayed at. We did have a little hiccup with the A/C but that was fixed immediately. We couldnt have asked for a better place and location. We will always come back to the Big Island and stay in the Waikola area. Thanks again and i look forward to the next trip. We just returned from an amazing vacation on the Big Island, and Kolea 15J served as the perfect home base! The unit is located in the Waikoloa area, with easy access to the beach, as well as many dining and grocery options. The unit itself was spacious and beautifully decorated, with everything our family needed. We especially enjoyed using the beach equipment! We would definitely return again, and hopefully it will be soon! Wendee Aono at Kohala Luxury Rentals is fantastic to work with! She provided us with great service in renting the beautiful Kolea 15 J villa during my familys stay in the summers of 2013 and 2014 and generously replied promptly with helpful advice that I needed about rental properties when I sought her help this year. I think very highly of Wendee and would be very confident in any future dealings with her though Kohala Luxury Rentals. The saying pictures do not do it justice seem to be meant for C204 at Mauna Lani. This was our third time to the island but first staying in a condo unit. We knew the island neighborhoods well so focused on a few in Mauna Lani and Waikoloa. When we saw C204 was available we jumped on it because of the view. Mauna Lanis south course is our favorite golf course here and hole #15 is the crown jewel a par 3 shot over the crashing waves of the acific below an incredible view. C204 looks out directly over this stunning panoramic view and has an amazing perspective of the entire Hanakaope Bay. If youre looking for a room with a view look no further!! Every morning and evening we would sit and enjoy a coffee or cocktail and take it all in and on several occasions saw humpback whales cruising the bay. It is important if this is your criteria to get a second or 3rd floor unit as well. First floor units have a hedge row blocking their view and several times we saw people on the ground floor standing on stools to get a better picture. The condo itself is terrific. Very well appointed with everything you will need to be comfortable. High quality furnishings, comfortable beds, a wine cooler, TVs in each bedroom it is clear that the owners enjoy living like they do when at home and have taken efforts to ensure that their time here as well as their guests is spent in comfort. We also enjoyed walking the fishermans trail along the ocean in the mornings and evenings a peaceful walk with stops along the way in spots offering information on ancient Hawaiian life here. The biggest surprise was the beach club. You can walk to it from this unit although we drove most days to carry our things. The beach is clean and has a sandy bottom up to about chest high water before getting rocky. The waves are small there allowing easy access for small children. They have rental kayaks and paddleboards on site, a great restaurant and bar, restrooms etc. The bay is called Makaiwa Bay. If you go on line and research the Best Snorkeling on the Big Island youll find that Makaiwa and Honokaope Bays are frequently cited. The coral is colorful, fish are plentiful and the reef is expansive. We caught a couple of calm days and snorkeled out to the buoy where a party ship would anchor carrying a group full of snorkelers. What we found there was these amazing arches in the reef teaming with fish. We never snorkeled directly in front of the condo but there is a buoy there too that a scuba boat came to at least 4 times when we were there. In summary C204 has it all. Proximity to restaurants and shops, the best golf on the island, terrific snorkeling and the most amazing views. We will be back. We just returned home from our stay in villa C204. From the start we received first class service from Wendee and team with immediate responses to all our emails and very helpful check-in information. The villa was spotless and decor equivalent to staying at a Four Seasons resort. The view was perfect of grounds and ocean and we could have spent the entire time just sitting on the Lani watching whales breach. The kitchen was fully stocked and lacked nothing. The resorts pool and grounds were beautiful. All and all a five-star stay and would most definitely stay there again. I would certainly recommend Kohala Luxury Rentals to my friends. C204 is truly a beautiful condo. The owners obviously have good taste as evidenced by the furnishings and the finishing touches. The kitchen is very well appointed with quality appliances, making cooking our meals an easy and pleasurable task. In short the unit (HK18D) was exactly as advertised. It was impeccably clean. Had all the needed supplies in the kitchen, bathrooms and rest of unit. Internet and tvs worked great. Wendee was very helpful both before and during the stay. Potential negatives for some people might be it is second story so there is a flight of stairs and it is a 5 minute walk to the pool, restaurant and exercise area. Very safe, quiet and clean area both in the complex itself as well as the entire Waikoloa area. If you dont have a good time here there is something wrong with you. My adult son and I visited Waikoloa and enjoyed our stay at this beautiful town home in a gated community. It is a great value. I would say the only drawback is you cannot really see the ocean from the place, but it is only a few minutes walk to the private club at the end or the road...and it is a great setting at the Oceans edge. It has a great pool, workout facilities, and restaurant (limited menu, but good), We played golf at Waikoloa and at Mauna Lani and will never forget the beautiful holes on the shoreline. Dinner at Ruths Chris Steakhouse was great and we also found a great brew house in Waimea. (Big Island Brewhaus). We thoroughly enjoyed our month-long stay at Kolea 15J. We are very familiar with this resort, having stayed in various different units over the years. This was one of the best and certainly the best equipped unit we have stayed in. We had some problems with the WIFI but Wendee responded quickly and fixed everything for us. A great place to stay. Absolutely 100% perfect, too perfect... This was our first stay at Kolea and we have stayed in many condos along the Kohala Coast and this one was the nicest we have ever stayed at. The pictures do not do the villa justice. A few things that a renter may want to know, the pictures do not do the view justice. At Kolea there are many units that face other units in the complex and have no view to speak of, this unit is on the second floor and faces the beach and hotel pool next door. The view is quite amazing and even though there is a photo in this listing it really is much better in person. The covered parking is close by and if you have visitors there is ample additional parking. The complex is very well run and picture perfect. The beach club was nice and not crowded, we were able to get a cabana or sit next to the pool each time we went. Access to the beach is great as well, there is also a gate that is a very short walk to the hotel property next door that is great if you want to get a meal or pay to use their pool. We did use the resort pool next door once, they give you a room for the day and it cost $99.00 for the entire family. This unit is very well equipped, clean and decorated nicely. The bedding is top of the line and the beds themselves are very comfortable. The air conditioning works ice cold, although we had it turned off often and just opened the pocket doors and enjoyed the cool weather. There are ample towels, beach supplies and kitchen items. The management company is great and responds to any issues in a timely manner. We loved this unit so much that we extended our stay two days. Our only disappointment is that the unit was booked in March for spring break and we will have to stay somewhere else. Thank you again for a great time and great unit. We have rented several of the condos at Mauna Lani Point over the past 20 years. We have used other agencies and can tell you Kohala works the best. Unit C204 at Mauna Lani Point is, in our opinion, "bulls eye" for , both the views and sunset. We saw pods of whales everyday. The interior decorating is A+, better than any condo we have experienced and the kitchen was especially well outfitted. 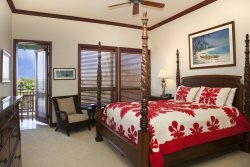 We wouldnt hesitate to recommend both Kohala Luxury Rentals and C204. It was fabulous! Is this unit available next year? Great location and service The condo was very clean and well appointed. Nicely decorated too. The high quality BBQ on the balcony was great for preparing local fish. The complex has a very nice pool with a hot tub and great outdoor fitness centre. There is a nice bar and restaurant with a good (if somewhat limited) menu. All of the staff were very helpful and nice. Definitely recommend this property and will likely stay there again one day. Wonderful condo in a lovely community. Well equipped kitchen with modern appliances including a coffee grinder. The ceiling fans allow you to have the widows open so you can enjoy the island breezes. The mattress in the master bedroom is top-notch. The balcony with a great Grillmaster grill made for some lovely dinners. The pool that is part of the complex is quite nice. The condo is nicely decorated with an Island motif. This is a fantastic place to stay while visiting the Big Island. PERFECT, AMAZING, SPLENDID and def RECOMMENDED I am a bit conflicted as for selfish reasons, I am not sure I want to rave about this condo as I want to be able to reserve it when I go to Hawaii.....however, I owe it to Wendee and the owners for allowing us to stay in their beautiful home. We just returned from a 3 day- turned-7-day-stay at this wonderful condo - we did not want to leave so we continued to add days to our stay until the day we had to fly home! . It was absolutely perfect - spacious, clean, modern, and ammenities galore! The condo was very clean and well-stocked with necessities (towels, soaps, bathroom tissues and paper towels) and MORE (wonderful to have some unique odds and ends (i.e. Mirin and champagne vinegar) for cooking dinner). And having laundry in the condo was a huge bonus. We rarely used the car once we were settled as it was only A 2 minute walk to the pool/gym (amazing community BBQ area/pool/ spa), just a short walk or bike ride to the Mauna Lani hotel/resort and just blocks to the market. Highly recommended (just dont take the dates I want next year!) It was a wonderful vacation and we will definitely return soon. Wonderful views, great condo complex, comfortable unit C204 has great ocean views from the lanai, living/dining areas, and master bedroom. The decor is a sort of warm Hawaiian-modern, quite stylish yet comfortable. Both beds were comfortable, no shortage of pillows! No shortage of TVs either. The kitchen is up-to-date and IMHO has a better than average selection of chef knives, pots and pans, and is well stocked with herbs, spices, and condiments. We were pleased to find several coolers in the hall closet, which came in handy for trips to the Waimea farmers markets, keeping our fresh produce cool and unwilted in a hot car. The Mauna Lani resort also has a really nice grocery (upscale Foodland), not to mention great restaurants (Canoe, Monstera are both great--try appetizers and cocktails at sunset at Canoe). The Point condo complex has a lovely pool/hot tub/outdoor entertaining/BBQ area. The grills in the BBQs were amazingly clean, and a very short walk from the condo. Check that area in the morning for a local paper. We snorkeled every day, either at the Beach Club or at the little rocky beach between the expert and intermediate tees for the 15th hole (you can see the entrance wall from the lanai, under the spreading tree). We had a great time, and our only negatives were that although the condo was generally pretty clean, it could use a bit of extra attention in the corners, but then, Im picky. The lanai furniture was very nice, but we missed having a little cafe table for dinners outside. Be sure to check behind the patio cushions for geckos before sitting down! We had fun watching them on the lanai, they are very cute and colorful. We would definitely stay here again. If you like great and easy snorkeling, this is a perfect spot for you.